On thursday I was lucky to get an invite from the UK agent to a seminar/tasting with Bruna Giacosa. There were 6 wines – 4 Reservas (red label) and 2 white labels (standard releases) to taste after some nice scene setting. Giacosa is undoubtedly one of the great names of Piedmont so an exciting tasting indeed. The winemaking is traditional with long macerations and the long ageing in large neutral, 15-25 yr old and non-toasted barrels. The decision on whether a wine is released as a red or white label is made in the cellar not in the vineyard. 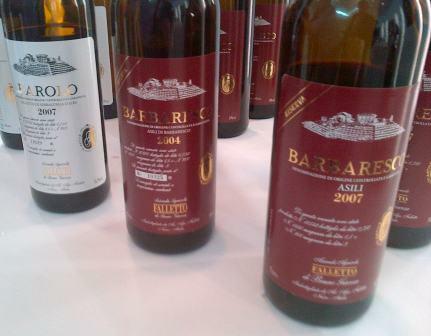 One important announcement that I had not heard before was that Santo Stefano (Barbaresco) will be made for the last time in 2011 meaning Giacosa will then have just one Cru in Barbaresco – Asili, and that is where the tasting started. I have scored the wines out of 20 to focus the mind. All in all a very good tasting.